The FBI has reportedly launched an inquiry into an attempted cyberattack targeting members of the first family. 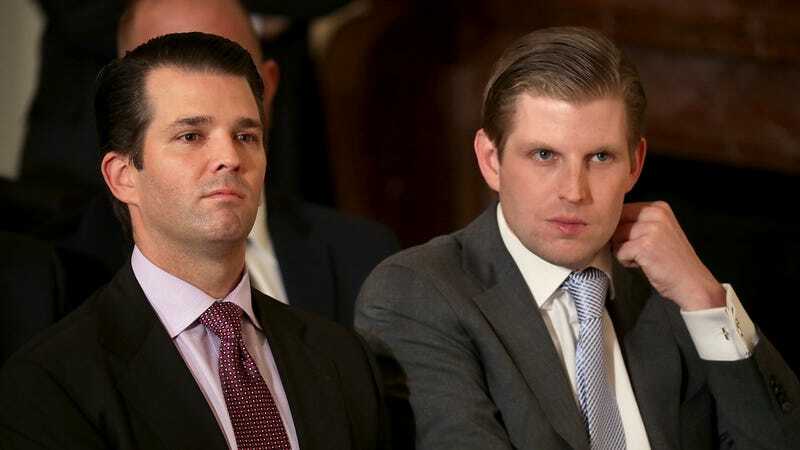 ABC News reports that Don Jr. and Eric Trump were summoned for an “emergency session” with agents of the Bureau’s cybersecurity division; a CIA “representative” was also reportedly present. The source of the alleged cyberthreat is said to originate overseas. Reached by Gizmodo on Friday, Bureau officials declined to comment and would neither confirm nor deny the existence of an investigation, which is protocol under these circumstances. A law enforcement official told ABC the Trumps attended a meeting at the FBI’s New York headquarters on May 8 to discuss the attack. Eric Trump denied any sort of breach occurred, telling the network: “We absolutely weren’t hacked. That’s crazy. We weren’t hacked, I can tell you that.” He would neither confirm nor deny meeting with the FBI. The Trump Organization’s cybersecurity is notoriously weak. Last October, for instance, Motherboard reported serious security flaws in Trump email servers running outdated software and operating systems. About a week ago, Gizmodo’s Special Projects Desk released a report detailing lax security at four Trump family retreats, including the so-called Winter White House, the Mar-a-Lago Club in Palm Beach, where Trump has hosted a number of foreign dignitaries, including Chinese President Xi Jinping. During a speech in Florida last summer, Trump encouraged hackers to target his campaign rival, Hillary Clinton.